Our southern mini-vacation began with a good old fashioned ice storm. The kind of ice storm that starts in the south, aligns itself directly with the I-95 corridor, and dares us to really really really want to make this trip. We do. And, it’s a long one. An ice storm from the south translates to just enough ice and snow precipitation to barely coat the roadways, with show stopping multi-vehicle accidents. For some, this is a very bad day. For us, it means more time on the road. More time to dream about reaching warming temperatures. Eventually our travels reached the North Carolina border where — remnants of the ice storm are still visible and temperatures remain in the 30’s. As we reach the South Carolina border, makeshift signs along Route 17 read “We have heaters”. Gas prices are at an all time low (of recent memory) – at $1.81 per gallon. After a long day of travels, we arrived at the KOA campground just 10 miles north of Charleston in Mount Pleasant. The temperatures are a brisk 30 degrees and I am cold to the bone. All of the T-shirts and shorts that I packed in anticipation of heat and lots of running opportunities – are not helping one bit. We make do -with LOT of blankets. I awake the next morning, in need of endorphins. It’s time to go for a run. 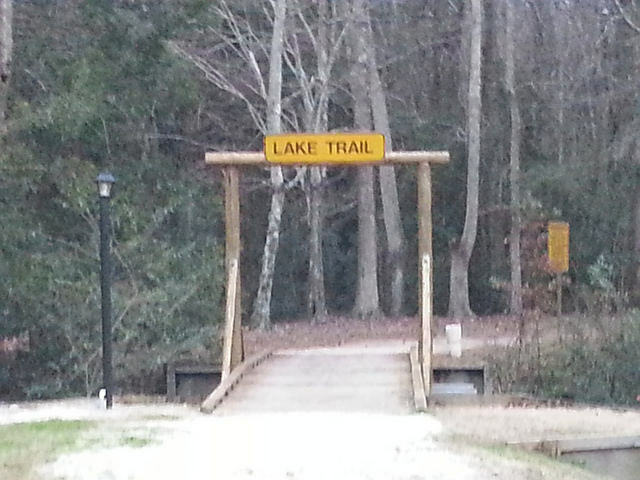 With Pat on bike, we opt to follow the signs pointing to “Lake Trail”. 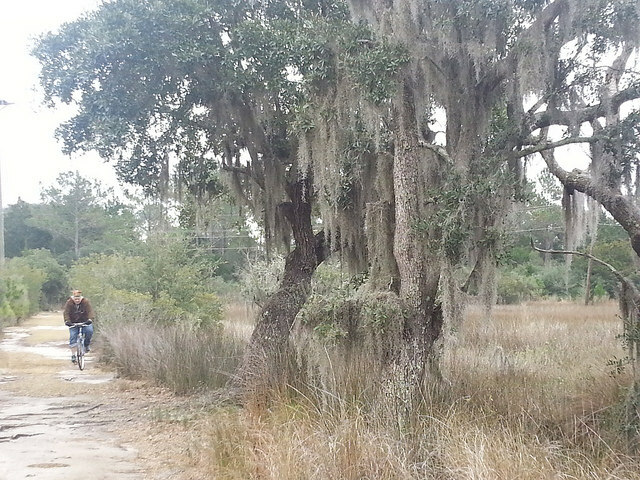 It turns out to be a delightful off road nature run through the low country swamplands. While I didn’t observe a lake, the trail was challenging to my footwork (trying not to trip over tree roots), and I keep a keen lookout for alligators. Not sure if alligators move about when temperatures are in the 30’s — but I keep a watchful eye anyway. Running helped me to get warm. We opted to spend the rest of the day touring Mount Pleasant and the Isle of Palms. Here we discovered that the architecture of homes in the historic section of Mount Pleasant resemble that of downtown Charleston. Huge porches, Georgian style and large trees filled with hanging moss. 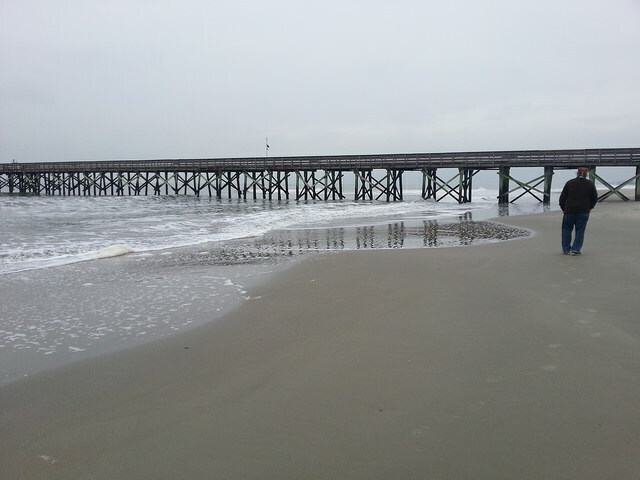 At the Isle of Palms, we found the beaches to be wide open, void of noticeable commercial ventures and a great place to walk for miles without seeing another soul. 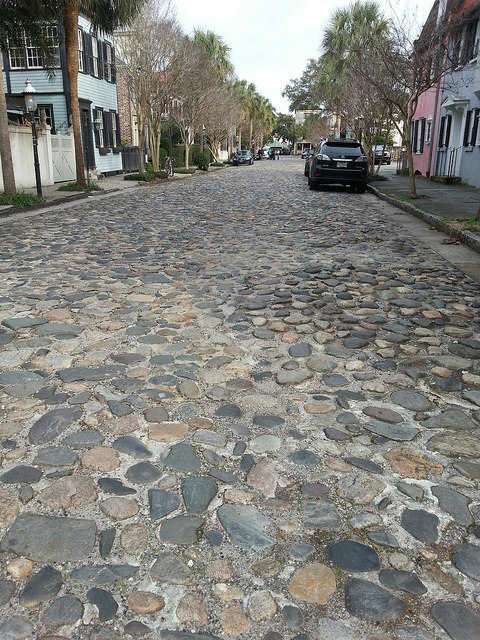 On Friday – we toured downtown Charleston. We walked along East Bay to the harbor promenade, along Market and King Streets and taking alley detours that beckoned with their quiet charm and stunning landscaping. There is something about Charleston – you can walk the same street over and over, and still find something new and adventurous to be discovered. By the afternoon, it was time to pick up our running packets at Burke Middle School which is located near the Citadel — for the upcoming half marathon and 5K runs. Saturday January 17 we would experience a whole new way to enjoy Charleston. I will run the Charleston Half Marathon – and hubby Pat will participate in the 5K event.